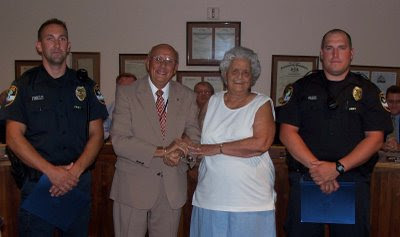 Two Elizabethtown police officers saved the life of a borough resident in May after using an automated external defibrillator (AED) to jump start her heart. When officers Nicholas Finicle and Richard Regel responded to the call of an unresponsive person on May 29, they found Shirley Nauman unconcious. Working together, they used the AED to shock her heart and then administered CPR until emergency medical technicians arrived. Nauman made a full recovery and was able to attend the presentation of life-saving commendations to both Finicle and Regel at Borough Council's July 16 meeting. During the presentation, she pinned the commendations on both officers and hugged and kissed each as her husband and members of her family looked on. In remarks prior to the presentation of the awards, Mayor Robert Brain said that only four other officers in the history of the Elizabethtown Police Department have received life-saving commendations. Although neither officer spoke, I am certain that if you talked to them about the commendations they both would say that they were just doing their job. And thanks to their commitment, their training and their quick thinking, that meant saving a life. I'm a reporter with Swedish Broadcasting. I'm doing a piece on the stimulus package. Would very much want to get in touch with you for a possible interview.